One of 6 apartments at Atlantis. Double, twin and family apartments available. Digital television with DVD player & an alarm clock with ipod docking. Lounge / diner / kitchen. 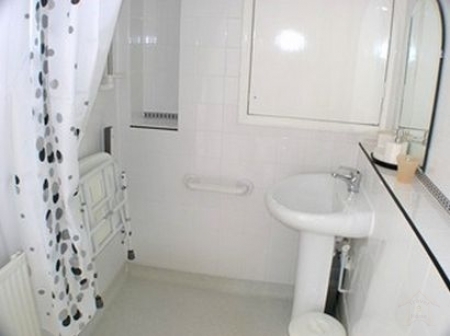 Wet floor shower room with shower seat, toilet and hand basin. Combi-microwave, hob, washing machine, dishwasher and fridge with freezer compartment. Digital television with DVD player, CD player with ipod docking. 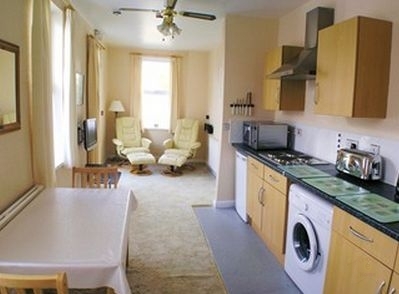 All bed linen, towels, iron & ironing board & hair dryer provided. Atlantis is a Non Smoking establishment including car park, gardens and pool area. Guests are asked not to smoke at the entrance to the driveway. 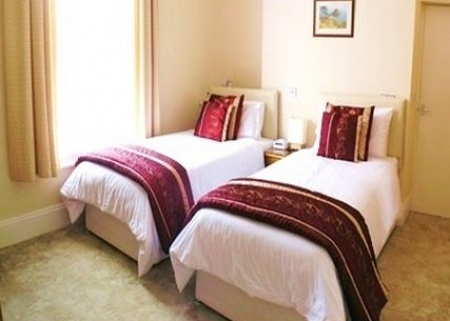 The accommodation and facilities shall only be used by the persons listed on the booking form. 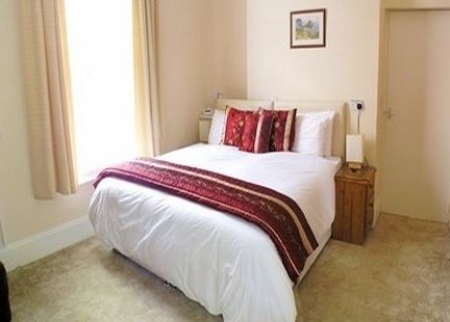 Guests must get permission from the proprietors before allowing visitors into the apartments. The apartments are designed for couples and families. Group bookings are not accepted. A deposit secures booking. The balance to be paid 42 days prior to the holiday. Online bookings:- Full payment required. Holiday Cancellation Insurance is included in the tariff for bookings of 7 days or more (T&C apply). Short breaks are not covered by this insurance. Terms and conditions Holiday Cancellation Insurance. Residents of UK, Isle of Man and Channel Islands only. Accommodation cancelled and NOT covered by the insurance may be refunded, less administration costs, ONLY if the apartment can be re-let for the original dates booked. Any discount made when re-letting the apartment will be taken off the refund. If the cancellation is made by Atlantis Holiday Apartments, due to circumstances beyond our control, and no alternative accommodation is available a refund will be given and no charges incurred. All guests are expected to leave the apartment clean and tidy. The hirer will be held responsible for the contents, condition and cleanliness of the apartment on departure. The apartment furniture and contents must be left as found. Any breakages, loss or damage to the apartment or premises, its fixtures or fittings, must be paid for, and for the purpose of checking, access must be given on the day or days before departure. If no or insufficient attempt has been made to clean the apartment, the person who is named on the booking will be charged an additional cleaning charge of 5.00 payable before departure. The proprietors will not be liable to any persons for personal injury, or loss or damage to property, including motor vehicles & contents.. Guests are requested to ensure that noise is kept to a reasonable level. The proprietors reserve the right to retake possession of the apartment if in their opinion, any party acts in a manner considered prejudicial to the comfort, safety or well being of others. In the interests of safety and for the benefit of all, children must not play in the halls, staircases or the car park. Persons using the pool area do so at their own risk and are asked to abide by the health and safety rules displayed. Children under 16 years must be supervised by an adult whilst in the pool area. No crockery/glassware is to be taken into the pool area. Plastic crockery is provided in each apartment. As this is a family environment guests are asked to wear appropriate swimming attire. One car parking space is provided for each apartment. We regret we are unable to accept any animals as we cater for persons with allergies. In the interests of safety guests are not permitted to use portable heaters, electric blankets, fryers or candles in the apartments. Atlantis operates a 'Green Policy' and guests are asked to help us achieve our aims by following some simple guidelines: e.g. Recycling paper, turning off lights and mobile phone chargers when not in use and conserving water. Full details on our Green Policy. Any concerns relating to the accommodation or facilities should be brought to the attention of the proprietors immediately. The proprietors shall not be held responsible for any facilities which are not available due to circumstances beyond their control. Greenway is a beautiful country house with a woodland garden on the banks of the River Dart. Of all its well-known owners it is Agatha Christie who is best known to visitors. She bought the estate in 1938 and used it as her summer residence until her death in 1976. Greenway was given to the National Trust by Agatha's daughter and family in 1999. The English Riviera is famous for its microclimate. It is much milder than the rest of the country. No area can beat our climate in the UK with more hours of sunshine than any other place in the nation. Directions to Atlantis Holiday Apartments: At the end of the M5 carry on along A380 to Torquay, continue onto A3022. Straight on at The Willows traffic lights (Sainsburys, M&S, Boots, Next & petrol station.) Straight on at next traffic lights passed Currys & Mc Donalds on left. Straight on at 4 sets of traffic lights - B&Q, Asda, Old Woods Hill and Shiphay lane. Follow signs towards the Seafront. When the road becomes 2 lanes get into right hand lane and take the right hand fork into Avenue Road at Torre Station traffic lights. (Halfords) At 2nd set of lights, Torre Abbey, turn right into Walnut Road. Ocean restaurant on corner. Take 2nd left into Rousdown Road. (Just over the bridge). Solsbro Road is the first turning on the right. Atlantis Holiday Apartments are approximately 150m on the right. We are only 400m from Torquay railway station.